Johanna was an EA in Fall 2013 and returned again this year as an EA in Bethlehem. The former village councilor of Husan shows us the field of destroyed olive trees. Photo EAPPI/J. Kaprio. In Greek mythology, warrior Goddess Athena and God of the seas Poseidon were competing over the possession of Athens. The mighty Poseidon struck his trident into the Athenian Acropolis, creating a well of salt water. While the public marveled at Poseidon’s achievement, Athena’s approach was more peaceful, she planted an olive tree just next to the well. The divine tribunal sided with Athena, for giving the city a greater gift: the first olive tree. In the Mediterranean region, olive tree symbolises peace and prosperity. In the occupied Palestinian territories, nearly 51% of the cultivated land is planted with olive trees and and the olive oil industry makes up to 25 % of the region’s agricultural income. But is there any peace or prosperity under the olive tree in occupied Palestine? In the morning of 9 October the Schawash family from the West Bank village of Husan was alerted to a saddening reality – at the eve of the olive harvest season they found 38 of their olive trees cut. They had not visited their olive grove for 3 days, and their discovery was a shock. While no one from the village was present during the time of the sabotage, which seems to have happened during dark hours, all clues seem to lead to the neighbouring settlement of Betar Illit. 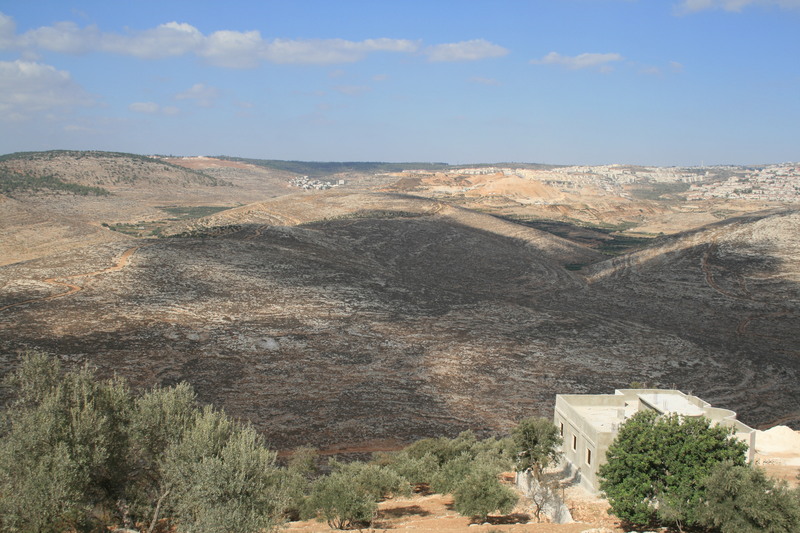 After all, it was only two days before that settlers of Betar Illit set fire to 15 olive trees in the village of Nahhalin and four months since they torched 60 olive trees in Husan. The sight of the field is devastating. 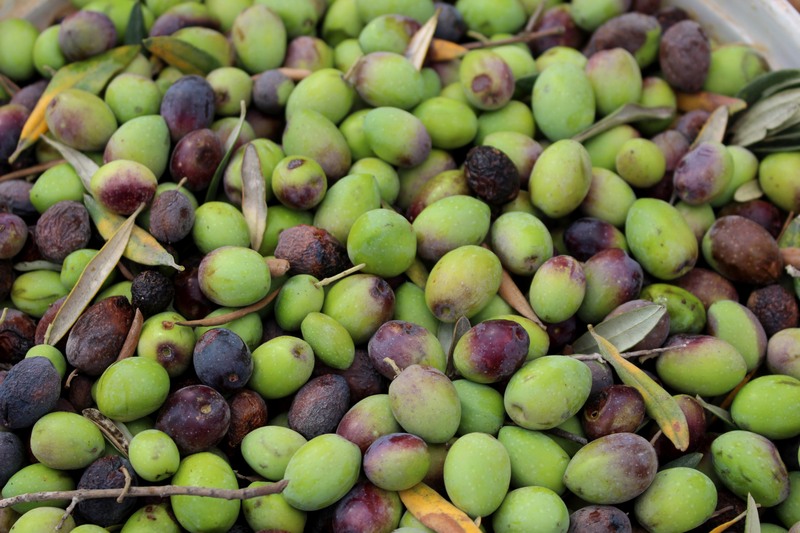 The cut parts of the trees laying on the ground have already lost their green color and the olives have dried. Beitar Illit can be seen in the background of the Shawash family’s olive tree field. 38 trees were damaged in the village of Husan. Photo EAPPI/J. Kaprio. By the time the olive trees were found, the leaves were dead and the olives dry. Photo EAPPI/ J. Kaprio. Mahmoud Shawash, head of the affected family tells us that the trees were 40 to 50 years old. Olive cultivation is the main source of livelihood of the Shawash family. Altogether they have 300 trees. Mahmoud Shawash estimates that the loss of the cut trees is between 40 to 50 gallons (150-190 liters) of oil. One gallon earns the family over 500 NIS (130 €). It would have been challenging enough without the devastation of the trees. As the weather has been dry in the region throughout the whole year, the harvest this year is poorer than average. The Shawash family estimates they lost 40 to 50 gallons of oil, a total loss of 20,000 to 30,000 Israeli shekels. Photo EAPPI/J. Kaprio. 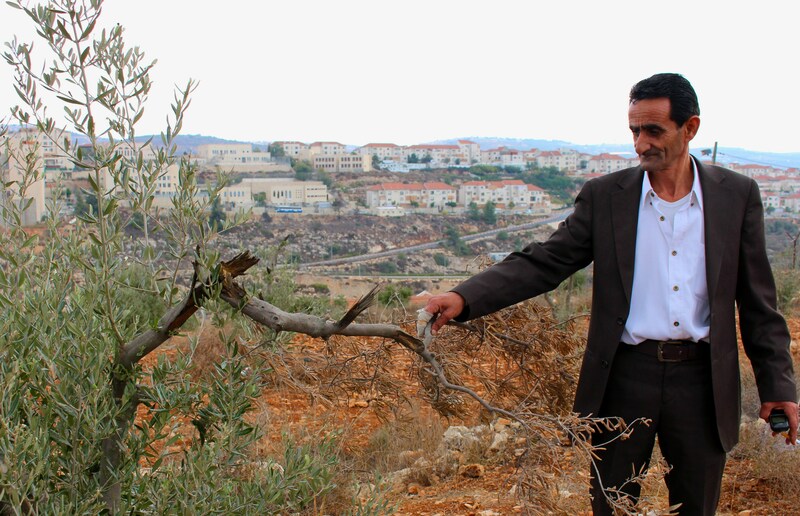 Settler attacks against olive trees are a constant threat to Palestinian farmers. In various incidents yearly, Palestinian-owned olive trees get damaged, poisoned, uprooted, burnt down or harvested by settlers. Between 2009 – August 2013 altogether over 38,000 trees ,. I remember just too well last year my EAPPI colleagues firefighting alongside with Palestinian farmers in Yalud, where Israeli settlers set fire to hundreds of olive trees. Only rarely do any of these acts of settler violence against Palestinian trees bear consequences to the perpetrators. According to Israeli NGO Yesh Din, between 2005-2012 only 1 out of 162 complaints lead to prosecution. But why would the settlers commit to such an act? “The settlers want to scare us out of our fields,” Mahmoud Shawash tells me firmly. His fear is not without foundation. For the Israel Civil Administration, which has the authority over the Area C of the West Bank, a farmer who continuously cultivates a piece of land over 10 years becomes the de facto owner of it. However, as the land registry process has been halted since the start of the occupation in 1967, land ownership after this year goes without official documentation. In addition, Israel follows the Ottoman Land Code which allows the state of Israel to confiscate land that has been left uncultivated for a period of three years and although by law state land should be allocated for the benefit of the local Palestinian population in the occupied territories, in reality it is usually allocated to Israeli settlements. Moreover, in a number of cases, Palestinian land owners have suffered losses of land as a result of Israeli authority imposed access restrictions to their fields, such as restricted permits and the separation barrier that in many parts of the West Bank separates farmers from their fields. Settler violence adds to these challenges. Indeed in the bigger picture, these acts of sabotage, committed by individuals but unpunished by the system, conveniently support an ongoing strategic land grab that Israel is carrying out in the occupied Palestinian territories, for the benefit of the Israeli settlers. 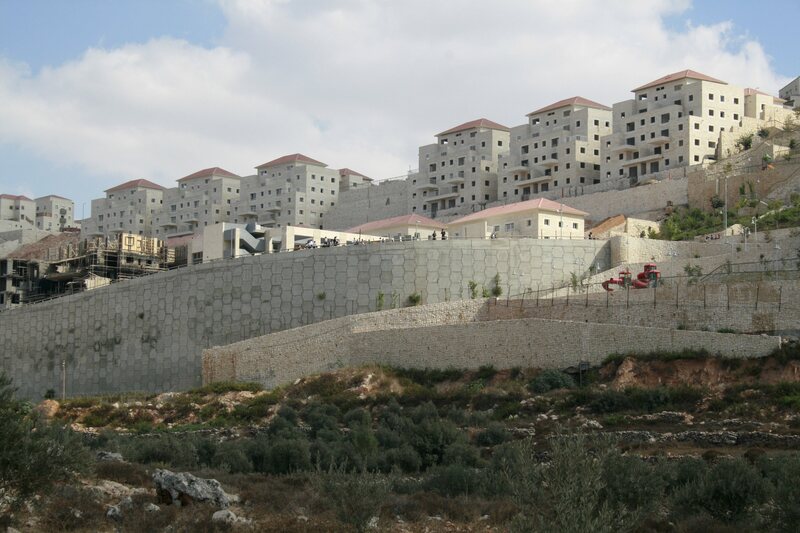 Betar Illit, which was established in 1984 on the lands of Husan village, is the one of largest settlements in the West Bank and among the most rapidly expanding ones. Israel’s recent announcement to confiscate 4,000 dunums (990 acres) of Palestinian land near Bethlehem, in order to allow for further settlement expansion, benefits the Betar Illit settlement and directly affects its neighboring villages, including Husan. This recent development causes anxiety among inhabitants of Husan as well as other Palestinian villages in the area. Beitar Illit settlement. Photo EAPPI/P. Costello. In the field, work continues nevertheless. On 18 October, I find myself back at the Husan olive groves, where we have been asked to join and help with the olive harvest. While we are picking olives right next to the fence of the settlement, there is a cheerful spirit of a family gathering and news exchange between some of the international volunteers that have come for help. Lots of Arabic coffee is consumed and stories are told. On this day, the olive harvest continued without incidents of settler harassment as has happened in the past. Photo EAPPI/J. Kaprio. The first day of the harvest goes by smoothly, no settler stones thrown on the harvesters and no curse words towards them, as has happened in the past. At least almost. A small incident during the day of harvest gives me a taste of what working next to a settlement can be like. While taking some photos of our work in process, we notice a couple of settlers filming us from a nearby house. It doesn’t take long until the military arrives. To my suprise, they want to speak to me. Question is, do I work for the television? And if I do, they would need to see my film. Unfortunately for them, I am just an ordinary person with an ordinary camera, and so they let us back to our work. On our way home through the village of Husan, we pass by a group of settlers from Betar Illit, buying eggs from a farmer from Husan village. It makes you wonder, how is it consistent that members of the same community who destroy trees at night, buy daily commodities from the same village during the day? Perhaps the answer lies on the fact that olive trees need humans to take care of them… Exactly what Athena wanted to show when she offered the olive trees as a present to humanity, for them to provide food, oil and wood over generation… Peace needs humans who will take care of it. 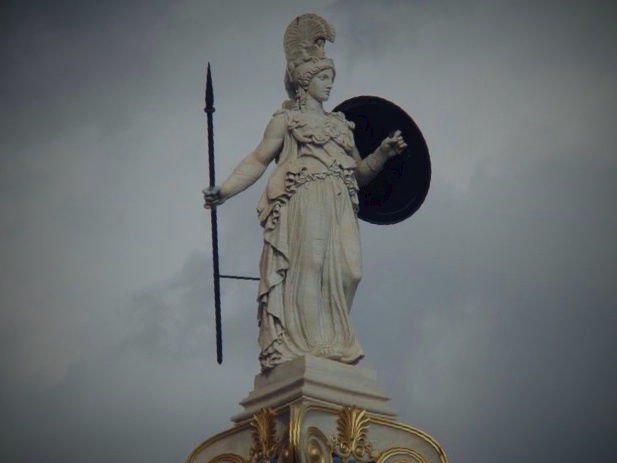 Statue of Athena in central Athens. Photo J. Kaprio. In line with Article 49 of the 4th Geneva Convention, the Israeli settlements in the occupied Palestinian territories are illegal, and their continuous expansion is the single biggest obstacle to what the olive tree symbolises: peace. *The article 38 cut olive trees and a box of eggs originally appeared on Johanna’s blog. After the Gaza ceasefire was agreed the Israeli government once again turned its attention to the West Bank and announced what Peace Now has called the largest land confiscation in 30 years, in which the Israeli government announced it will confiscate 4000 dunums of land. This land covers a large area in the Gush Etzion settlement block and directly impacts on several of the villages that the Bethlehem team covers. We travelled to the affected villages to meet with local contacts and see first-hand what is happening. Al Jab’a is just one of these villages and the story told here is repeated across the area. When we first called our contact Sheikh Nasser he stated that he didn’t think it would affect Al Jab’a. Sheikh Nasser explained to us that they feel the village is under siege already. Most of the village is area B but parts are area C, and of the 110 houses, 18 have demolitions orders against them. The welcome to Al Jab’a sign the village put up was also in Area C and was duly removed by the Israeli Army. The road linking the village to the next closest village of Surif was closed off by the Israeli army some years ago leaving the villages cut off from each other. Despite the grim reality, Nasser agreed to meet with us and show us the village. By the time we had arrived the information had started to come out and the impact on Al Jab’a had become clear. The confiscation would allow the nearby settlement outpost of Bat Ayin and Gava’ot to expand out as far as the green line, encircling Al Jab’a and cutting it off even further from the rest of Palestinian life. A view to the north of Al Jab’a. On the right is the Palestinian village of Wadi Fukin and the Israeli settlement of Beitar Illit. Most of the empty land will be confiscated. Photo EAPPI/P. Costello. Nasser himself was losing all his agricultural land that belonged to his family on the outskirts of the village and he took us out to show us the land and the military signs declaring the confiscation of his land. Much of the land has already been in effect denied to them because he and his family try to work on it the Israeli military comes and forces them to leave, telling them they are no longer allowed to use this land. Sheikh Nasser stands next to a sign on his land declaring it as state land. 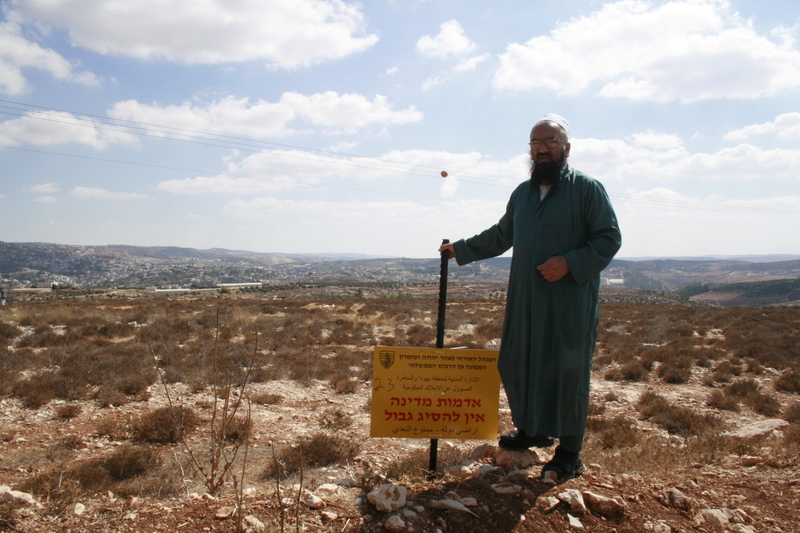 The Israeli military will not allow him to use this land. Photo EAPPI/P. Costello. Nasser introduced us to Abu Harras, another resident of Al Jab’a who has lost 1000 olive trees, which were cut down by the Israeli military. When he replanted them, the military returned again and said that he had a choice – to cut them down himself or they would cut them down again and send him the bill for this ‘service’. 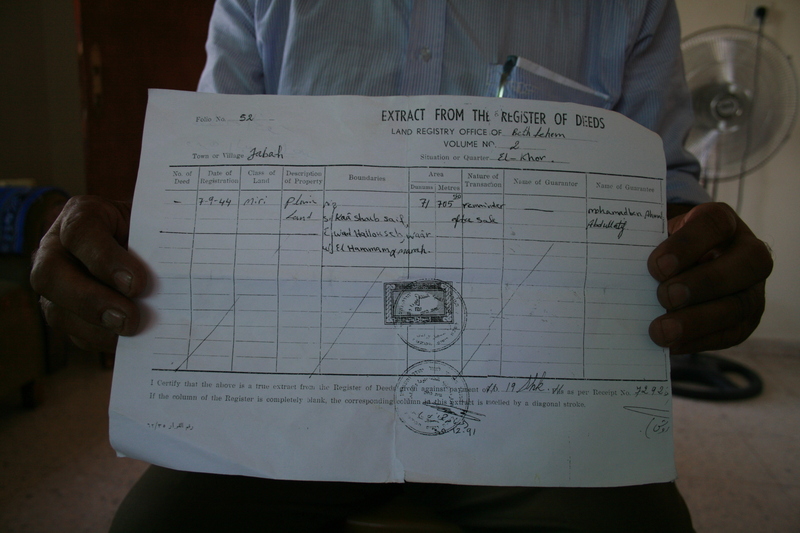 Abu Harras showed us his British Mandate era deeds for his lands, and produced volumes of paperwork relating to previous court battles over his trees and his land, all of which will be lost regardless under the new confiscation order. Abu Harras shows us his British era land deed. Photo EAPPI/P. Costello. Israeli settlements are illegal under Article 49 of the 4th Geneva convention. This fact has been reinforced by several UN resolutions declaring them not only illegal but a barrier to peace. This land confiscation and the subsequent growth will choke Al Jab’a, and pile the pressure on an already struggling village. There is some confusion now, with some reports saying that the land confiscation is not going ahead. However, the locals in Al Jab’a point out that they have been driven off their land already by the Israeli army and Israeli settlers. In fact, the fields already have basic water and electricity infrastructure in them ready for building. The locals of Al Jab’a believe that the Israeli government means to take this land one way or another, and if not now they will do it in smaller batches when no one is looking. 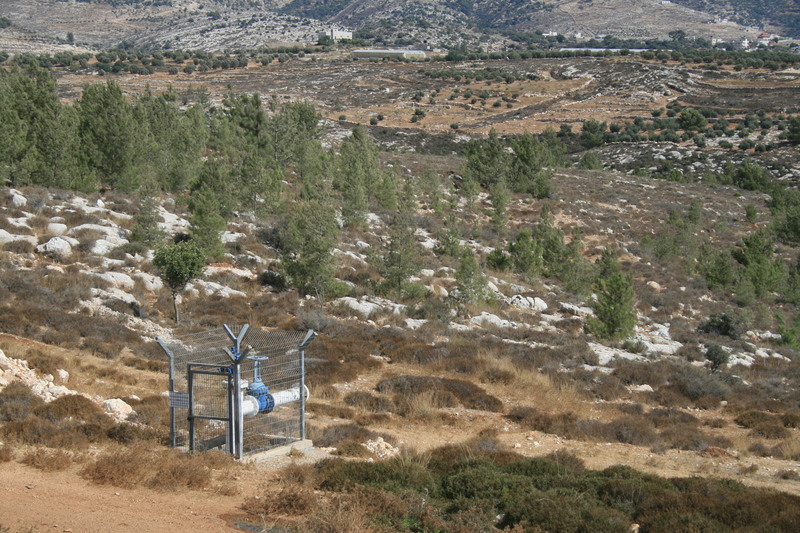 There is already water infrastructure on the land to be confiscated for future building of Israeli settlements. Photo EAPPI/P.Costello. *Read about more stories about Land Confiscation.